A circular letter from the Zionist Congress Executive Committee. Signed by hand by Theodor Herzl and Dr. Oser Kokesch (committee secretary). Vienna, December 31, 1900. German. A long circular letter (three pages) typewritten and mimeographed. An anti-Zionist notice, published in the newspapers on 27.12.1900, is cited on the first page; it claims that the Zionists are to blame for the prohibition imposed by the Ottomans on immigration to Palestine. The circular letter claims that this blame is just "a fairy tale" and that according to a reliable source in the Turkish court the atmosphere in the ruling circles tends to favor Zionism, seeing it as a great opportunity to develop the area (several months after this letter was written, Herzl was received, for the first time, by the Turkish Sultan, and negotiated granting the Jews a chartered company in Palestine). 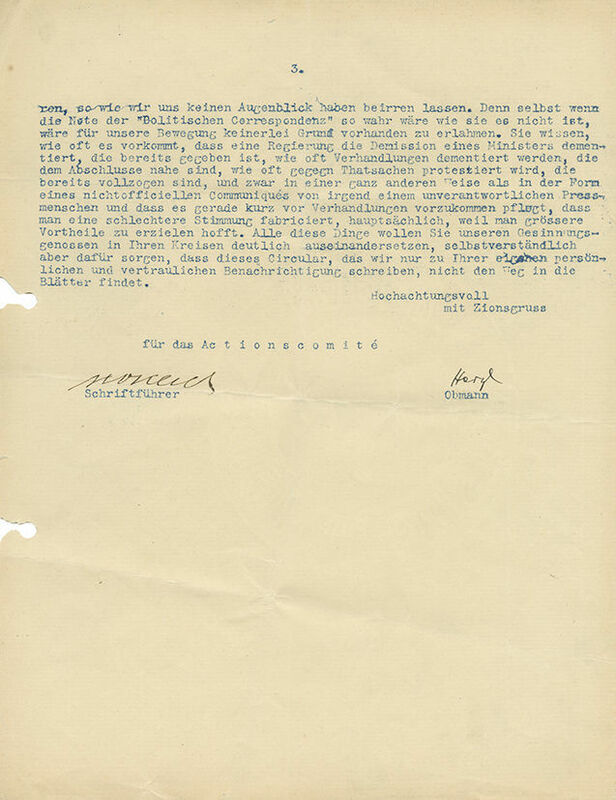 Printed on top of the letter – "streng vertraulich" [strictly confidential]. At the end of the letter appear the signatures of Theodor Herzl and Dr. Oser Kokesch, secretary of the Zionist congress executive committee. leaves, approx. 27.5 cm. Good-fair condition. Folding marks, some stains and tears at margins (mostly small). Filing holes. Open tears between the margin and the filing holes (not affecting text).